Did Obama Kill Public Campaign Finance? Democrat Barack Obama has drawn in more money than any presidential candidate in history. Critics argue that represents a backward step in campaign finance reform. Others see Obama's success as an attempt to level the campaign-funding playing field. Republican presidential nominee John McCain addresses a rally on in Woodbridge, Va., Oct. 18, 2008. 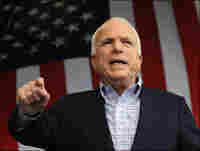 McCain warns that Obama's accumulation of such massive amounts of money can lead to fundraising abuses. Read an online debate about public financing between Fred Wertheimer of Democracy 21 and Cleta Mitchell, a longtime campaign finance lawyer. Is something rotten in the state of public financing for presidential campaigns? Sen. John McCain, one of the most vocal proponents of campaign finance reform, is being hoisted by his own petard by choosing to accept federal funding for his general election campaign. Meanwhile, Sen. Barack Obama, the choice of the Democratic Party — the very party that cried out for finance reform in the wake of the Watergate scandal — has chosen to bypass public funds and, as a result, is pummeling McCain in the fundraising arena. Irony alert: The Republican standard-bearer is using federal grants, while the Democrat extols the free-market virtues of individual campaign donations. Critics argue that the fact that Obama raised a record-smashing $153 million in September and has drawn in more money than any candidate in history is a backward step in campaign finance reform. Obama's fundraising prowess "makes the argument for public financing pretty damn weak," says Craig Shirley, a conservative strategist and author of an upcoming book about the 1980 election, Rendezvous with Destiny: Ronald Reagan and the Campaign That Changed America. McCain, speaking to Fox News, warns that Obama's accumulation of such massive amounts of money can lead to fundraising abuses. Obama is "completely breaking whatever idea we had after Watergate to keep the costs and spending on campaigns under control," McCain says. Gary L. Bauer, president of the conservative group American Values, says: "I agree with McCain: Obama is buying the presidency and has increased the chance of future corruption." But others see Obama's success as an attempt to level the campaign-funding playing field. Millions of donors giving relatively small amounts — as opposed to large interest groups giving unlimited amounts — is, arguably, further democratization of the process. The Obama campaign reports it had 632,000 new donors in September, and the average gift was less than $100. In an essay titled, "Money in the 2008 Presidential Elections: A Collapse of the Campaign Finance Regime?" Thomas E. Mann of the Brookings Institution writes that this cycle "provides some encouraging developments for those concerned about the role of money in politics." The bright spots include the rise in the number of small donors, investments in grass-roots campaigning, and "signs that suggest fundraising is more an indicator than a cause of interest, energy, and electoral appeal," he writes. Or maybe this particular presidential race is just that: particular. Perhaps this is one of those moments in American politics when a candidate inexplicably catches a wave and is able to capitalize on disgruntlement and disenchantment in a lightning-in-a-bottle way. At least financially. Mann is not sure that Obama's success can be replicated. "There is no guarantee that these developments will continue into the future," he writes. "The success of small-donor fundraising in this election cycle will be difficult to match in years without strong national political tides and by candidates without Obama's star quality." In his essay, Mann traces the troubled history of public campaign financing, which was established in 1974 as part of the Federal Election Campaign Act. Since then, it has been an integral part of presidential elections, but in recent years it has begun to falter. Though funding grants have been used by every major-party candidate in every general election since 1976 (until Obama said no thanks this year), in recent campaigns, both Democratic and Republican candidates have forsworn the grants during the primary seasons. In 2000, George W. Bush turned a cold shoulder on the primary-season money and was able to raise more funds than Al Gore before the general election. President Bush did the same thing in 2004. Neither Obama nor McCain accepted public funds during the nominating process that began in 2007. Obama drew in more than $428 million in contributions through August and McCain brought in more than $190 million, according to the Federal Election Commission. Once McCain applied for public funds to fuel his fall campaign, his spending was limited to $84 million. For Obama, who turned down the federal funding, the limit is the sky — as long as each donor gives no more during the general election campaign than the federally allowed $2,300. As a result of all the donors, Obama "has unleashed now in presidential campaigns a new flood of spending that will then cause a scandal, and then we will fix it again," said McCain, who with Sen. Russ Feingold (D-WI) sponsored the Bipartisan Campaign Reform Act of 2002 that tightened the governing of political contributions. McCain stops short of saying that Obama has done anything illegal or improper, but the Republican candidate says, "History shows us where unlimited amounts of money are in political campaigns; it leads to scandal." The McCain campaign points out that Obama doesn't disclose donors of $200 or less. By law, such disclosure is not required. The Washington Post reports that in September, Obama used the Internet — Web advertising and e-mail solicitations — to raise more than twice the record $67 million he accumulated in August and more than three times the one-month record set in 2004. So far more than 3 million people have contributed more than $575 million to Obama during the entire campaign process. Obama's huge cash advantage has allowed him to overwhelm the McCain campaign with a flood of advertising. Obama is able to promote his campaign not only in old-school venues such as television and Web sites but in innovative spaces such as video games. Obama has purchased a 30-minute time slot on several networks to show an infomercial. He can meet McCain's negative ads one for one, and run positive advertising as well. While McCain is pulling out of states such as Michigan that he sees as unwinnable, Obama's money allows him to wade into states such as Utah and West Virginia that Democrats heretofore had considered to be lost causes. At the same time, Obama is bolstering his organization in traditionally Republican strongholds where the race has narrowed this year, such as Missouri, Virginia and North Carolina. Mac McCorkle, a Democratic policy strategist in Durham, N.C., says that Obama's big spending "may mean the world" on Nov. 4. Loose purse strings allow Obama to have a vast grass-roots organization and run several TV ads for every one of McCain's. The money also ensures that Obama "is not going to be beaten strategically by the McCain campaign," McCorkle says — though there could always be surprises when the votes are counted. "I don't know if this is the end of public financing, because Obama is such a unique candidate," McCorkle says. "He's almost like a movement. He's not the regular mainstream candidate. I don't think John Kerry could have done this. Or Al Gore or even Bill Clinton." McCorkle says, "For the run-of-the-mill candidates who think they are just going to use the Internet to raise a lot of money, it's overly optimistic." As for the future of campaign finance, McCorkle favors a "United Way" approach: Corporations, philanthropists, other groups and individuals would be able to donate an unlimited amount, with transparency, that would go into an endowment — akin to the United Way charity fund — and be divided equally between the parties. Thomas E. Mann of Brookings leans toward "the idea of public matching funds as seed money for candidates, released much earlier than permitted by current law and not tied to spending limits." He writes that such a move might provide lesser-known candidates a better chance of building support for their candidacies before the primaries even begin. Conservative Shirley says that if Democrats argue for public campaign financing after this election, "it will just make them look like hypocrites." Regardless, if Obama does get elected, it will be fascinating to watch. After he has been a president for four years and perhaps is seen as a member of the establishment and no longer a fresh-faced leader of a movement, will he again want to eschew federal funding as he has this time around? Or, if he sees that his wave has crested and the fervor has died down, will he reach out and grab federal funding with both hands in 2012 like a long-lost friend?